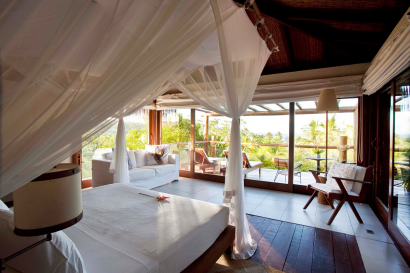 Txai Resorts transforms the art of receiving guests at home into the concept of a boutique hotel. The word Txai, inspired by the Indigenous kaxinawa means companion, and symbolizes the attitude of friendship we have while receiving guests in our resort. The simplest reasons for you to celebrate life are created every moment. Designed with the philosophy of exclusiveness, the Txai Resort hotels are located in places of rare scenic beauty. We are structured to support ecological sustainability, responsible social development and respect for the culture and local community, enjoying transparent relationship with regulatory bodies. Each one of our hotels is unique, but we share the same feelings: the wish to take our guests on a journey to authentic places, tastes and experiences, showing the body and soul of every region in Brazil. Everything in good time. Every effort is made for each moment to be experienced as an unforgettable experience. We renewed 34 bungalows during 2016. 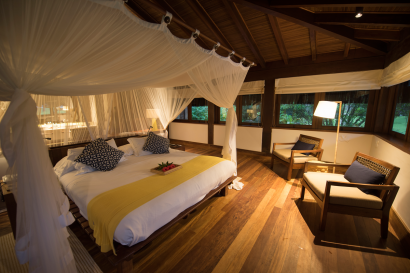 – Txai is a very special place for relaxing and enjoying nature in its best state, is located on an ancient coconut and cacao farm, an estate of 92 hectares (227 acres) situated in the Environmental Protection Area of Itacaré Serra Grande, in the Itacaré municipality. Our 38 bungalows and apartments are spread throughout the farm, in harmony with the surrounding coconut trees. They may be located just a few steps from the sand or at the top of hills, with the most stunning ocean views, surrounded by the fauna and the flora and is very close to our private 5 km beach. Txai is located in the neighbourhood of Itacaré Village, in South Bahia, Brazil. Typical scenes of the culture from Bahia are present in Itacaré. The joy of the local people, the vibrant colors, the dance, the capoeira, the remarkable flavor of the local cuisine, the small church, the lighthouse, the fishing village, the cocoa farms, the green and the sea. Itacaré has its origins in an indigenous village. It staged the Portuguese colonization in 1530 and is today the living scenery of the culture from Bahia. The cultural and folkloric roots from Bahia are closely related to the African culture brought in by slaves. The capoeira, the cuisine and the candomblé are strong expressions of the Afro- Brazilian culture. 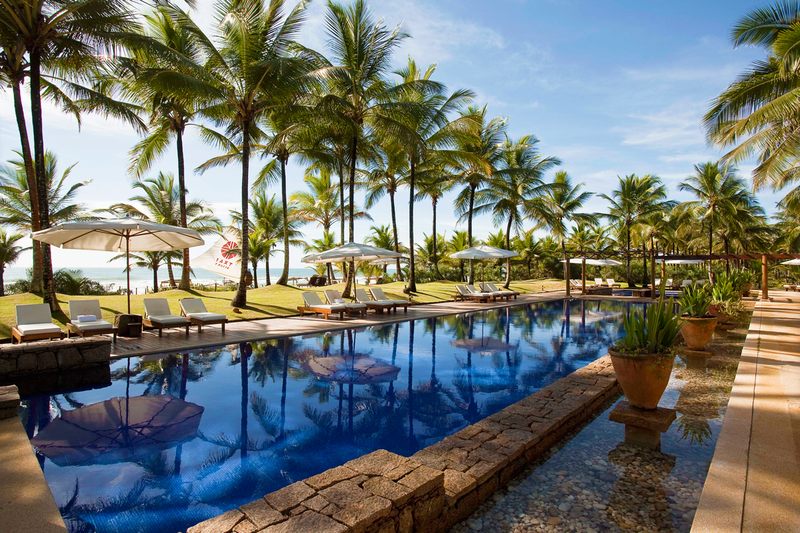 Friday is the day for white in Bahia. It is now almost a tradition to dress in white, for those who believe in Candomblé or not, in homage to Oxalá. 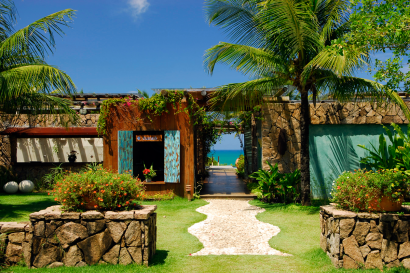 The raw materials for the handicraft in Itacaré come from Nature. Coconut trees and dendê palm trees are the preferred ones for local artisans to create utensils and decoration pieces. The Papier Marché is also used to create African masks, as well as regional fruit. A genuine art that integrates the environment with the community. Most of the farms that produce cocoa in Brazil are situated in the South of Bahia, close to Ilhéus and Itacaré. Some of them are open for visitation, where it is possible to get to know the whole process of cultivation and processing of cocoa, and also savor the fruit right off the tree. 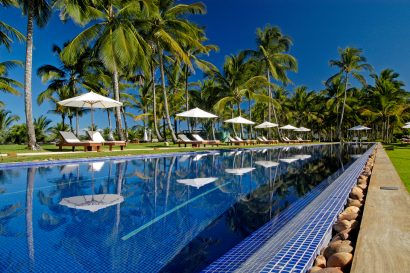 Itacaré offers much more than beautiful beaches. It has rivers, waterfalls and a large Reserve of Atlantic Rainforest, considered the second largest Brazilian rainforest. It has one of the richest ecosystems on the planet regarding diversity of animal and vegetal species, and has been considered a Biosphere Reserve by UNESCO since 1991. We are in the middle of the forest so there are may activities such as hiking, tracking and canoeing. To really improve the guest experience with nature. The Tour House, concerned with your wellbeing, offers trained, qualified and equipped guides for your safety during its activities. We strive to minimize our environmental impact, by promoting ecotourism activities that respect the Atlantic forest of southern Bahia, considered to be one of the greatest biodiversity on the planet. The Tijuípe Waterfall is one of the most beautiful places in Bahia. Leaving by car towards South, we walk for around 10 minutes along a beautiful stretch of Atlantic Forest up to the waterfall, where we can enjoy a delicious and energizing waterfall bath. The Cocoa Farm is where you can see how chocolate is made and appreciate a Cocoa plantation. Leaving on highway BA-001 towards the village of Serra Grande. From that point, we cover a 5km stretch on an unpaved road around the State Park of Serra do Conduru. The route runs through the Atlantic Forest, until we get to São Francisco Farm, where there will be a tour to the local cocoa planting and processing activities, with the opportunity of tasting it right from the tree. Return along that same road up to the Serra Grande belvedere. After taking some pictures, you may swim on the Pé de Serra beach, followed by a bath at the Tijuípe waterfall. Painting, manual handicraft works made of coconut and clays, and all types of children’s play. It´s a paradise to discover in family, kids can really interact with nature, follow a baby turtle release, see monkeys and loads of other species in their own habitat. Finding out how the cocoa turns into chocolate and having a whole beach to play and discover. 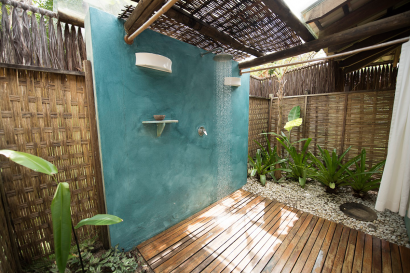 Our most sophisticated bungalow, with greater privacy, is located in the hill and has a privileged view of the sea and the local forest, as well as a private swimming poo. 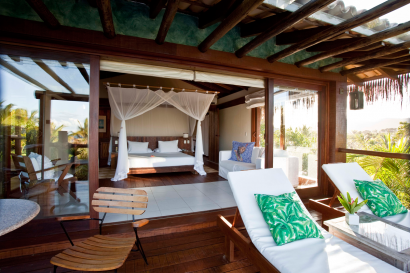 The 70m2 bungalow is built on a deck on stilts, with an outdoor shower, a private balcony and chaise-lounges. The extra pampering includes a 58° LCD TV, a home theatre, a dock station, a Nespresso machine and a wine cellar for twelve bottles. The 70m2 bungalow, is built on a deck on stilts, with a private balcony and an outdoor shower. The bungalows are spread all over the Txai complex, both at the beach and in the hills. 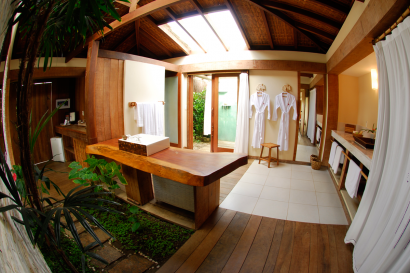 The extra pampering includes a 27° LCD TV, a Nespresso machine and a mini-bar. The 60m² bungalow is built on a deck on stilts, with a private balcony and an outdoor shower. The bungalows are spread all over the Txai complex, both at the beach and in the hills. The extra pampering includes a 27” LCD TV, a Nespresso machine and a minibar. 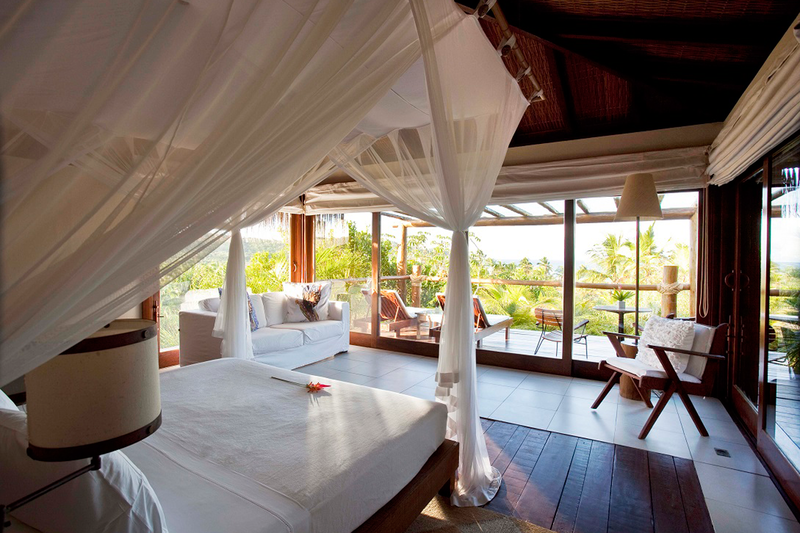 • Luxury Apartments: the 60m2 apartment is built on a deck on stilts, with a private balcony and an outdoor shower. They are located at the beach level or in the hill and have a fantastic ocean view. The extra amenities include a 27° LCD TV and a mini-bar. • Superior Apartment: the 45m2 apartment is built on a deck on stilts, with a private balcony and an indoor shower. They are built on blocks of four horizontal apartments. The extra amenities include a 27° LCD TV and a mini-bar. 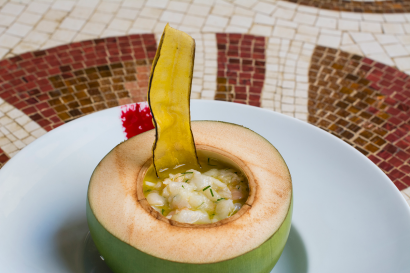 Contemporary gastronomy, which respects the traditions of the Bahian culinary. 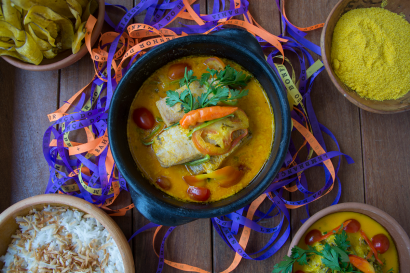 The alchemy takes place when we blend passion, regional ingredients and international culinary techniques. In the hands of experienced chefs and a highly professional team, nature gains unique flavors and scents. The sommelier suggests the right wine to harmonie with the dishes. We have a vast selection of South American and International wines in our wine cellar. 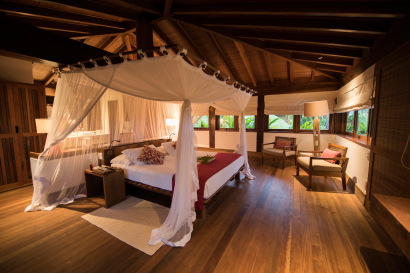 It is possible to prepare an exclusive dinner with total privacy and quality of services, surrounded by the exuberant nature of the Itacaré Txai Resort. A healing space. We offer a unique selection of practices and treatments to reach all senses, which cause small and sensitive transformations that lead to feelings of wellbeing. The touch, the landscape, the music, the scents of Shamash essences reach all our senses and provoke little and sensitive transformations that lead us to the well-being state. A delight, that refreshes, stimulates our perception and relaxes our senses. Enjoy! 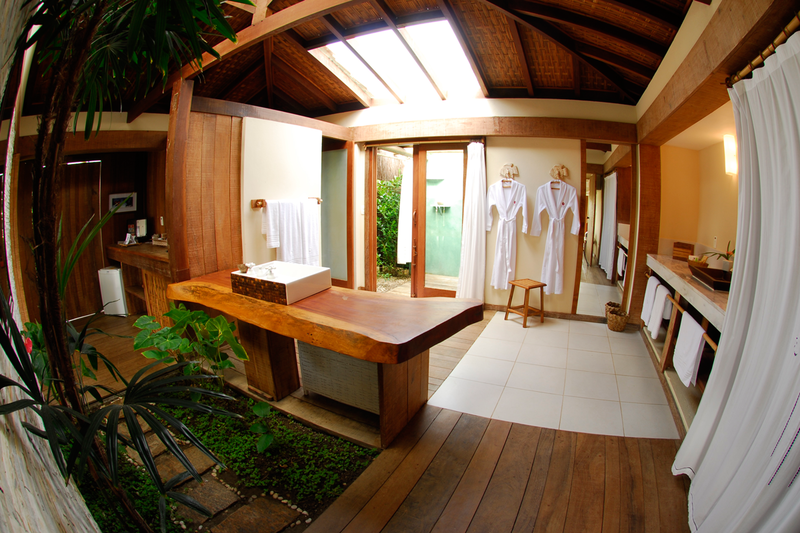 Discharge baths is a tradition in Bahia, and it has been our inspiration to this practice. 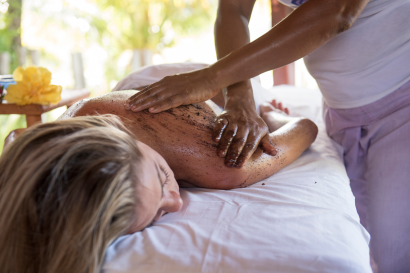 We start with kosher salt and coconut oil rubbing, cleansing the entire body and its energetic field. Afterwards, you get a seven-herb, warm and scented bath. This alchemy between the rubbing, the bath and therapeutic properties of the salt and the herbs favors the balance between body and soul. It clears the mind and brings freshness and lightness to the spirit. It is indicated for the moment you arrive to Bahia, in order to wash the soul and free your body memory from tensions of the urban life; or at any moment, whenever necessary to change the emotional state, start something new or to come to another perception of the situation. Different spaces fit the size and needs of each event, whether a wedding celebration, a birthday party or a corporate event. 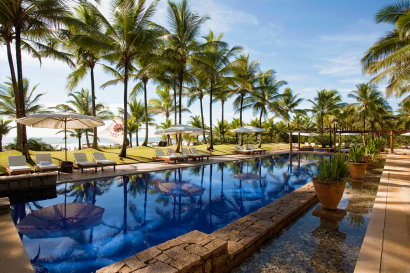 We can comfortably accommodate up to 250 people in spaces that highlight the amazing view of the gardens, the pool and the sea. We transform your event in a unique experience for each guest.